DESCRIPTION Two of the most beautifully coloured grahiums in the one frame. AKA Purple Spotted Swallowtail - Graphium weiskei. This small graphium is one of only two butterflies we have with a shade of purple, hence it is one of our most popular frames. The unique colouring of mauve changes to pink under certain lighting and accompanied by subtle shades of blues and greens make this butterfly a must for any collector. 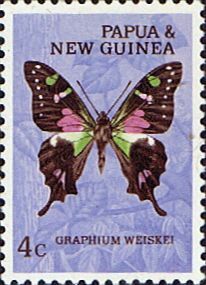 Though it was Carl Ribbe who first described this butterfly, the name derives from the one who collected the first sample, the German naturalist Emil Weiske. Graphium stressemanni. This small graphium is very similar to the weiskei but this species has a beautiful blue / sea green colouration. Due to its rarity it is more difficult to stock.